I have had a busy spring and summer working on opening my own brewery. After a half-year hiatus, it feels good to “saddle up” and get back to writing about the good, the sour, and the funky once again. Today’s article will be a mixed bag of those three descriptors. We are going to explore a recent collaboration beer that am I excited to be involved with, Powell’s Blackberry Kveik. 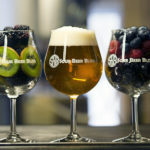 The point of the article is not so-much the beer itself, but rather the process of working with new ingredients and ways to steer a beer towards a target goal. My objective is to try to convey how, as a brewer, I think about a new beer from concept to glass. I think this particular beer is a great example because it employed yeast, ingredients, and techniques that I had never used before. Lets dive in! Like most good ideas in my adult life, this one was born while enjoying a few beers. 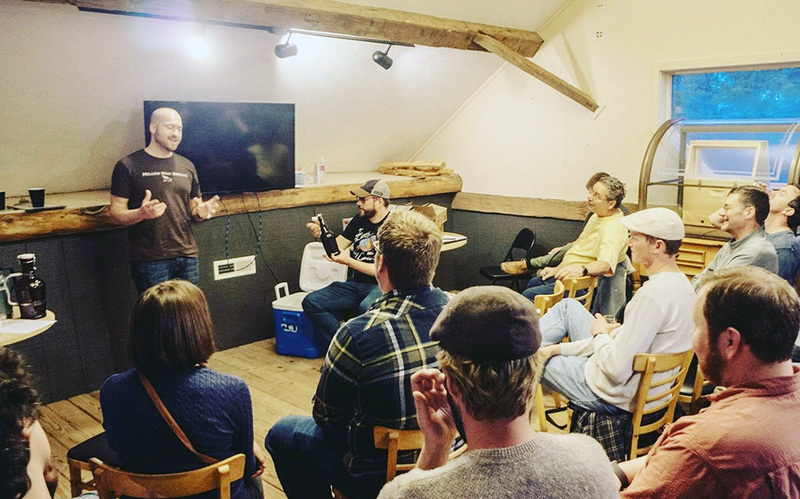 In April, my good friend Brad Moyer and I were invited in give a sour beer talk to the State College Homebrew Club. It was a fantastic experience. We were treated to dinner, got to participate in a club competition, held an open-forum talk on sour brewing, and then socialized over a number of tasty and well-made homebrews. 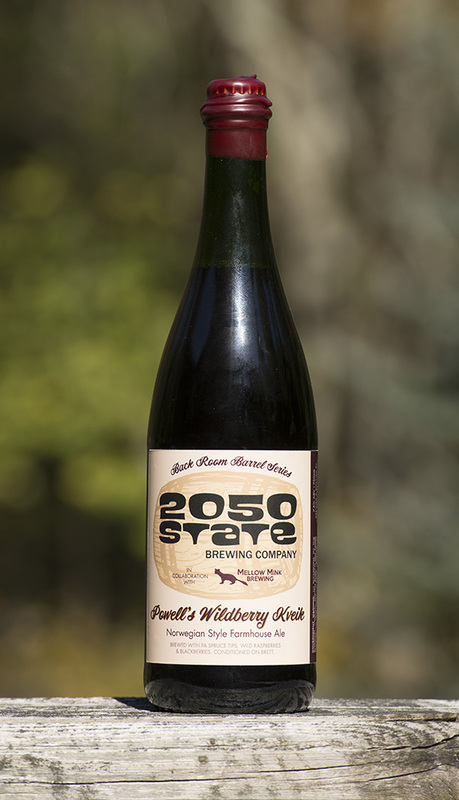 Brad had recently accepted a position to operate a local nano-brewery called 2050 State Brewing Company. As we drove home, he posed the question “Would you like to brew a collaboration beer with me?”… and the gears began to turn. Dr. Lambic giving a talk to the State College Homebrew Club. 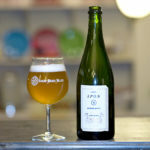 Naturally, I was inclined to suggest that we go with a sour or farmhouse beer of some nature, and we quickly began talking about Norwegian farmhouse brewing. To provide some background, Western Norway has a long history of farmhouse brewing / homebrewing traditions. For hundreds of years, the brewers there have been storing, reusing, and passing-down local yeast cultures. These Kveik strains (Kveik is a dialect word for yeast in that region) have become independently domesticated and represent a lineage of Saccharomyces cerevisiae separate from those found throughout the rest of Europe. These yeasts are interesting in a number of ways. 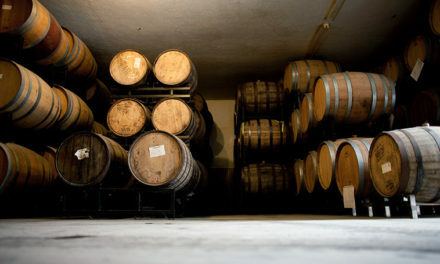 First, these regional brewers have been storing Kveik yeasts dried on straw, linen, or wooden blocks called kveikstokker (yeast logs) for generations, which has given the majority of these strains superior survival capacity even when dehydrated. Second, local brewing practices prefer to pitch yeast into wort that is much hotter than standard and encourage fermentation to be finished quickly (often in under 2 days). 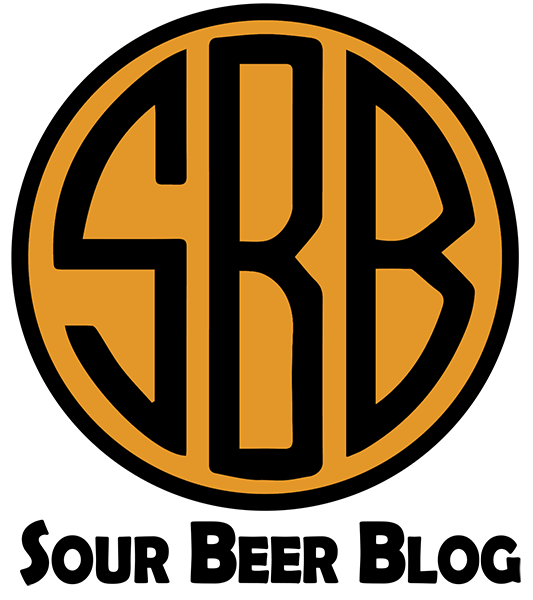 These practices have placed selective pressure on Kveik strains to be capable of a rapid fermentation at much higher temperatures than most Saccharomyces strains are comfortable with. What is also interesting to note is that most Kveik strains handle these temperatures without producing strong phenolics or fusel alcohols, two off-flavors common in hot fermentations. The third trait I will highlight is that some Kveik strains, including the one we chose, are capable of producing good attenuation in high-gravity beers and strongly flocculating after fermentation is complete. These characteristics, high attenuation and high flocculation, are typically not associated with one another. It was these features combined with the potential for new flavor profiles that drew Brad and I toward Kveik for our collaboration. In Norway and throughout much of northern Europe, Juniper is a traditional ingredient in many farmhouse beers. It is frequently infused or used as a lautering aid and of course imparts its own unique flavors to the beers. The problem Brad and I discovered during our drive back from State College, is that neither of us are particularly fond of the taste of Juniper. We decided that instead, we would like to experiment with Spruce tips in the brewing process. We knew that in Pennsylvania, it was almost time for Spruce trees to be entering the growing season, and that we had tasted beers using Spruce tips to a positive effect before. From that decision point, we arrived on a concept: A farmhouse beer made using Kveik yeast, that would include spruce tips, have a moderately high ABV, and should be light to amber in color. My brief introduction to Kveik has only “scratched the surface” of Norwegian farmhouse brewing. 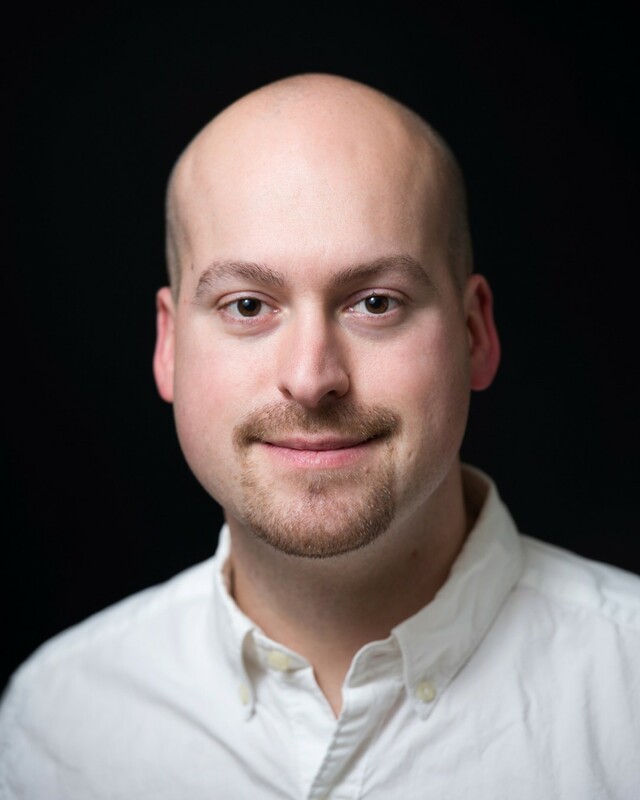 To learn more, I suggest reading Lars Garshol’s expansive blog on the subject. Both Brad and I are big proponents of tasting ingredients before committing them to a recipe. Thus the following week, we contacted a friend and local farmer, Jim Booth, of Powell’s Valley Hop Farm. Jim was able to provide us with samples of three different varieties of Spruce tips from his farm: American Blue Spruce, Concolor, and Norwegian Spruce. Cale Baker and I were working on some planning for Mellow Mink when the samples came in. We tried two methods of tasting: chewing the tips directly and soaking them in water to make a tea. Ultimately the teas were a little too weak to come to a decision, so we went with the chew method. The results were surprising! The American Blue Spruce tips were earthy, musty, and not much else. The Concolor tips tasted the way pressure-treated lumber smells, very strongly woody, and not in a positive way. In a complete contrast, the Norwegian tips were awesome. They reminded us of blackberries, with a light acidity, tannins, and some citrus elements. These were the obvious choice for the brew. 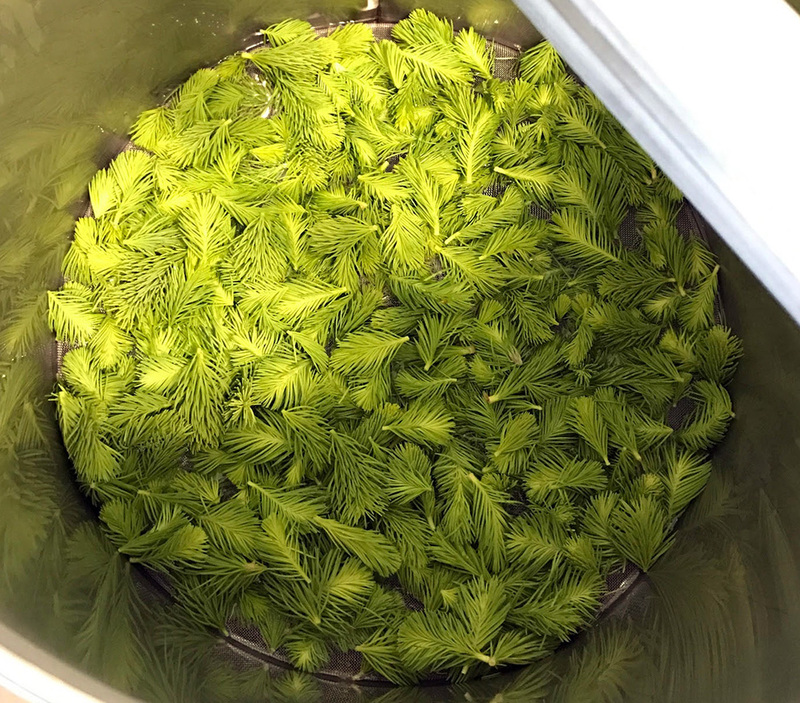 Norwegian Spruce Tips in the bottom of the mash basket. 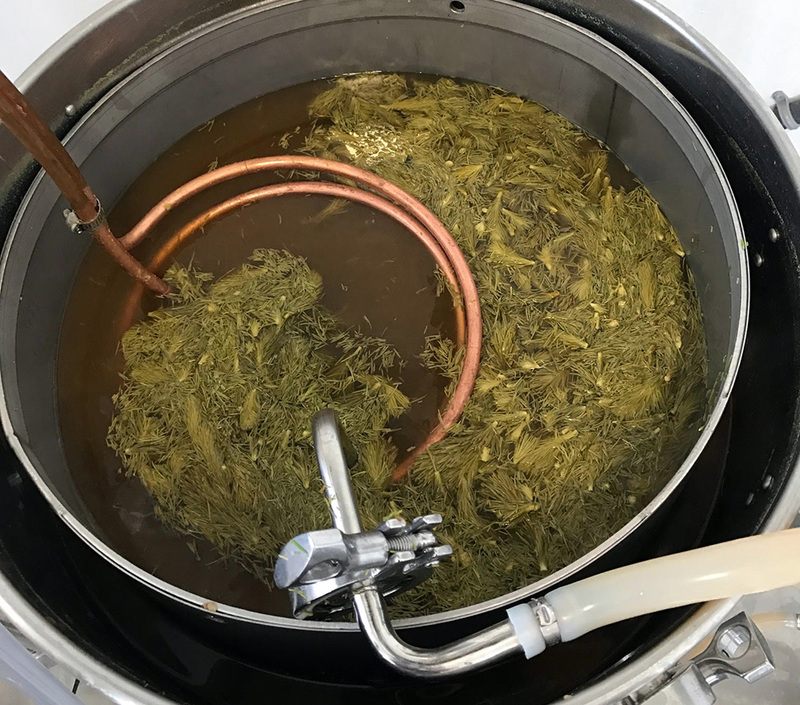 With this recipe, we knew that both the hops and the Spruce tips could potentially add bitterness to the beer. Therefore we decided to break up our use of the Spruce tips in two ways. First we would incorporate half of our intended addition underneath the mash bed as a lautering aid. Once the beer was fully sparged, we would taste the wort to determine what bitterness, if any, was contributed by the Spruce tips and scale our hop addition up or down to suit. The second charge of spruce tips would be chopped up and added 5 minutes before the end of the boil, we chose this timing to (hopefully) avoid bitterness while maximizing the extraction of those citrus and blackberry flavors we were looking for. It turned out that our choice was a good one, as the final beer achieved both results. Our overall hopping goal was to achieve 30-35 IBUs. We went with a 26 IBU addition of Cascades at 60 minutes, for both bitterness and pine-flavors. We also went with a 6 IBU addition of Saaz, split equally between 15 and 5 minutes, for a contribution of spicy and herbal hop character. When tasting the wort after sparging, we could not detect any bitterness from the Spruce tips. Therefore we opted to include our full calculated hop charges. Chopped up Spruce Tips steeping as the wort cools. Lastly, I should note that we used carbon filtered borough water, made an adjustment with lactic acid in the mash to target a pH of 5.2, used 1 tablet of Whirlfloc as a kettle fining agent at 15 minutes, and boiled for a total of 90 minutes before cooling to a knockout temperature of 95° F. Our original gravity was measured by refractometer at 1.062 SG. To ferment this beer, we prepared a 4 liter starter (1.040 wort) using 1 vial of The Yeast Bay Sigmund’s Voss Kveik. This started was grown on a stir plate and maintained throughout a 72 hour period at 95° F. within a temperature controlled fermentation chamber. This starter was tasted (Citrus and floral esters. No phenolics, sulfur, or off-flavors.) and the full volume was added to the 15 gallon batch. We pitched the yeast into 95° F wort and maintained that temperature for 48 hours. We then increased the fermentation temperature to 100° F for a (probably unnecessary) cleanup and attenuation phase. All apparent signs of fermentation were completed within 72 hours. We achieved a final gravity of 1.005 for an estimated 7.5% ABV. The beer was allowed to rest and slowly cool for another 3 days before being force carbonated and served on draft at the brewpub. 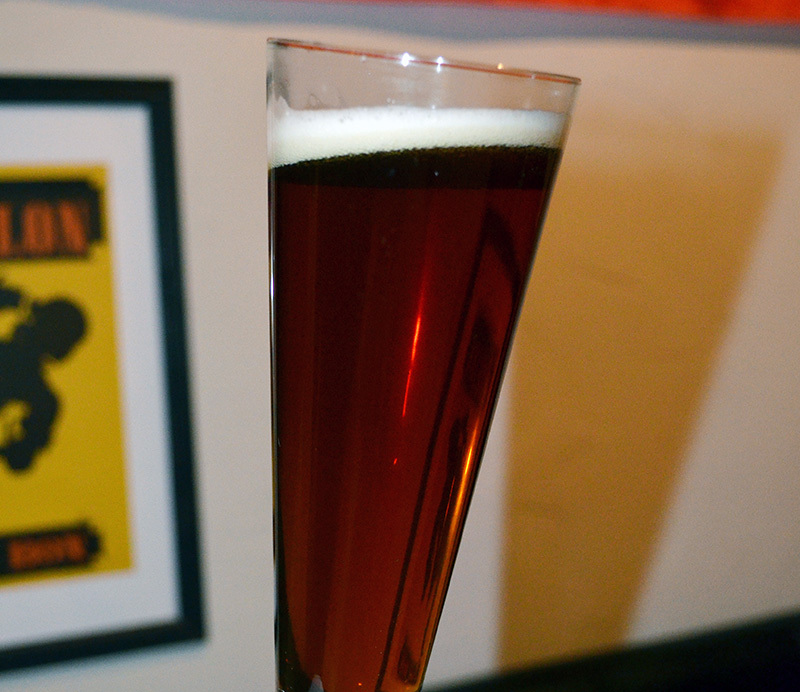 Overall, Brad, Jim, and I were very pleased with how this beer turned out. 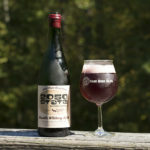 The fermentation profile was dry, earthy, herbal, and showcased pine, citrus, and berry flavors without being spicy or phenolic like many saison-based farmhouse beers we were familiar with. The bitterness to maltiness was well balanced and despite the high fermentation temperature, the beer did not portray any fusel alcohols or other off-flavors that we could detect. Like all of the small batch house beers at 2050 State, the beer came and went from the tap list within a matter of days. Overall the beer was well received by patrons. A few days after it was kicked, Brad approached me with an idea: Lets create a second version for bottle release. Spruce Abuse on draft at 2050 State Brewing. Both confident in the initial results, and feeling more familiar with what we could expect from the ingredients, Brad and I decided to add two new elements to the bottled version: fruit and funk. Our idea was to marry the berry flavors we were tasting from the Spruce additions with real berries. We also wanted to introduce some more exotic esters, phenols , and the ability for the beer to develop and cellar well once bottled through the addition of Brettanomyces. Jim came through again with 15 lbs of ripe and juicy wild blackberries and black raspberries from the family farm. For our second brew, we repeated all of the same brewing and fermentation processes and ingredient choices to create the base beer. We then aged this base for one month on a blend of the wild grown berries. Finally, we dosed the beer with corn sugar and The Yeast Bay’s Lochristi Brettanomyces Blend. While we have not used this blend extensively, we chose it for its potential to create additional (straw)berry esters and likelihood of introducing more farmyard funk over time in the bottle. Jim designed the labels and Brad opted to wax the bottles to commemorate the beer as the first public bottle release from 2050 State Brewing Company. Powell’s Blackberry Kveik pours a deep ruby red with a moderate level of rose colored head. Its aromas are bright with blackberry, pine, white grape, light dried leaves, and a fruitiness that reminds me of gummy bears. 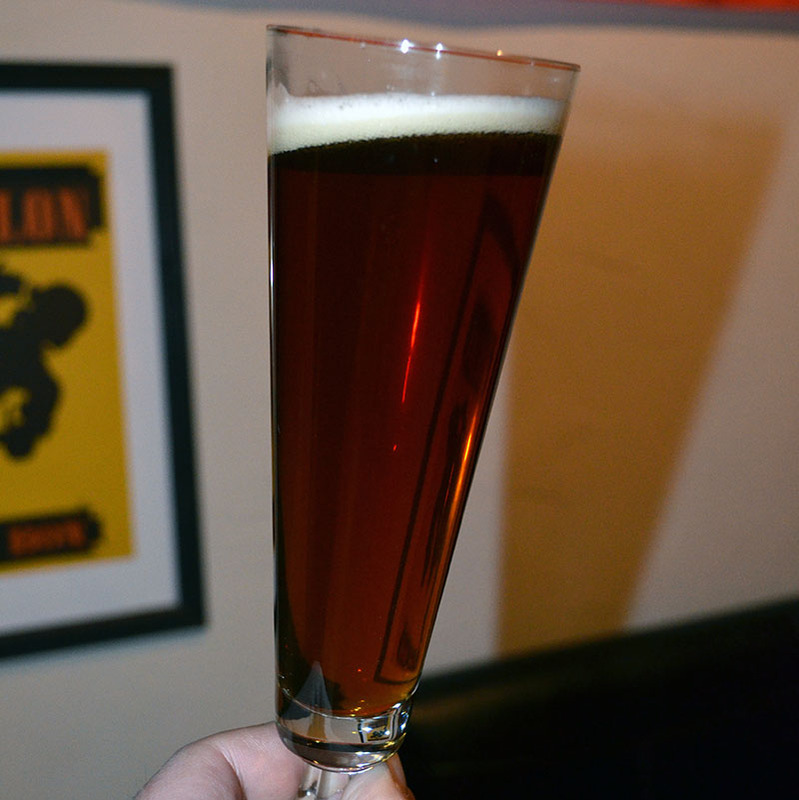 When tasting, the beer has a medium body with a medium to high carbonation level. There is little to no alcohol presence, a low to medium bitterness, a vinous tannic structure, and a light creamy / waxy character. The malt takes a backseat with light grainy and bready flavors balanced against a very light fruit acidity and a low to medium hop bitterness. The finish is dry and champagne-like with some tannin clearly evident from the berries and spruce tips. The berries shine brightly through the aroma, flavor, and finish of the beer while the fermentation and Spruce tips back up these fruit notes with a welcome balance and complexity. 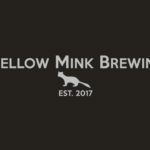 I encourage you to check out Mellow Mink Brewing’s Website and Instagram, 2050 State Brewing’s Website and Instagram, as well as Powell’s Valley Hop Farm’s Facebook and Instagram. Bottles went on sale at 2050 State Brewing’s taproom The Brewhouse Grille (2050 State Road, Camp Hill, PA 17011) on Wednesday, October 11th, 2017. 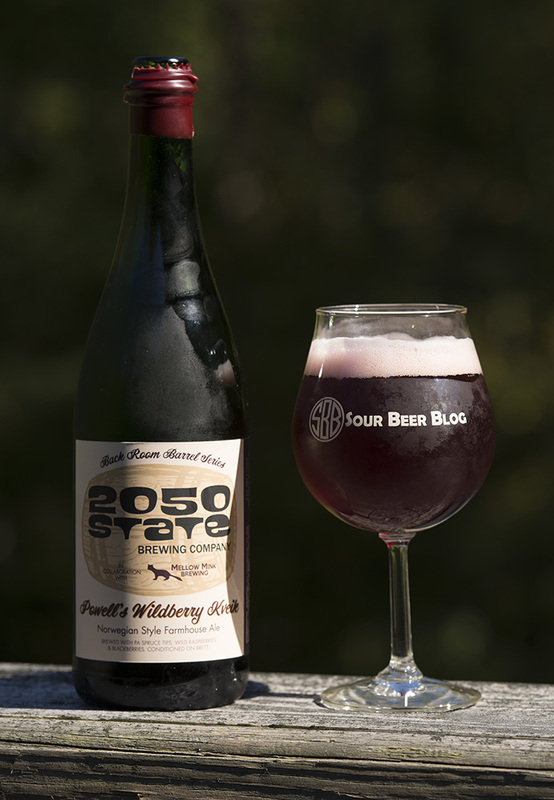 Overall, the first bottle release for 2050 State Brewing was a great success. 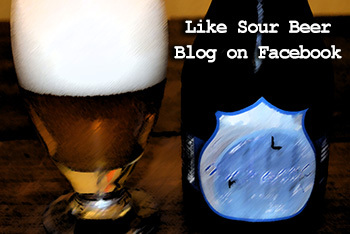 I was happy to hear that several Sour Beer Blog readers made it out for the release! 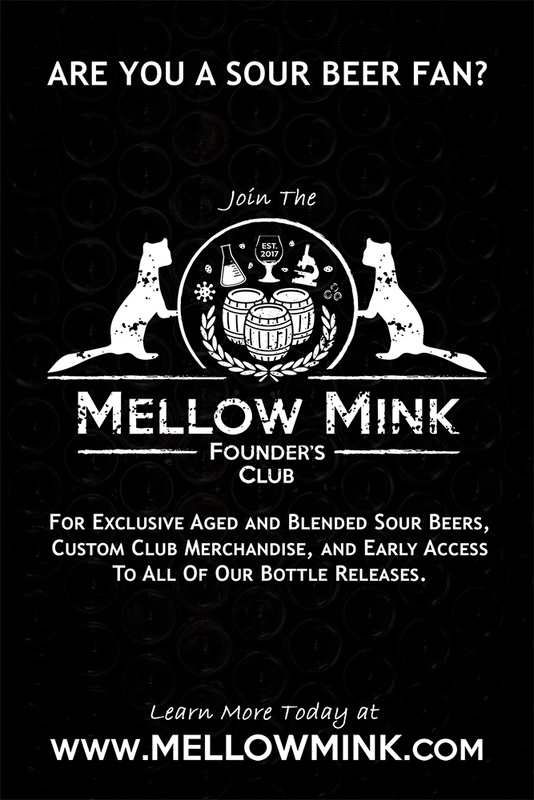 This certainly won’t be the last time that Mellow Mink Brewing or 2050 State Brewing experiment with Kveik yeast strains or collaborate on beers. Personally, I am interested in exploring the combination of Kveik ester profiles with true sour beer acidity. Additionally, it hasn’t escaped my attention that these strains ferment well at the same temperature ranges as many strains of Lactobacillus. 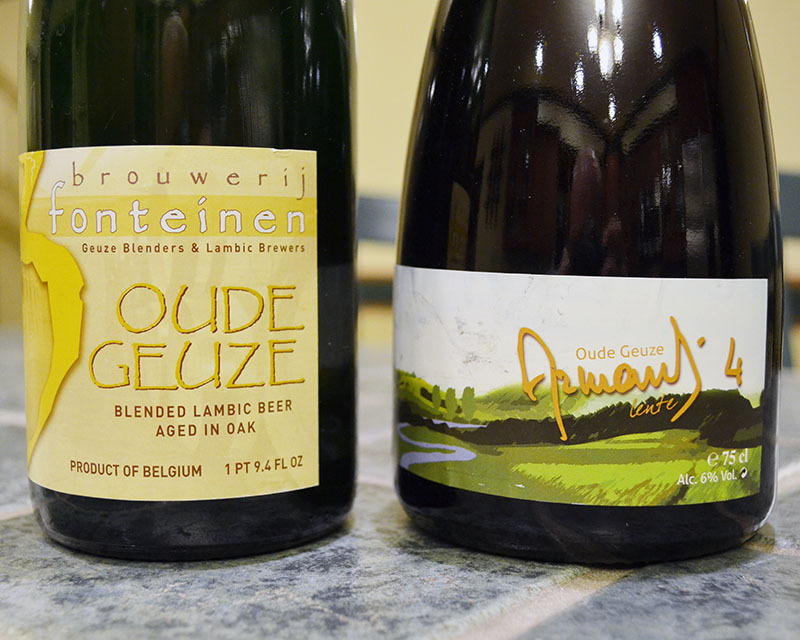 The combination of the two could make for some interesting fast-sour beers that don’t skimp on complexity. 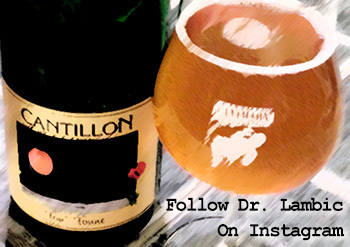 It feels good to be back on the “blog-waves”, sharing my brewing thoughts and experiences. As always, I appreciate you taking the time to read. I hope this article was both interesting and entertaining. If you have any questions, comments, or would simply like to say hello, please don’t hesitate to email me. “Kveik.” Milk The Funk Wiki, Milk The Funk, 4 Oct. 2017, www.milkthefunk.com/wiki/Kveik. Preiss, Richard, et al. Traditional Norwegian Kveik Yeasts: Underexplored Domesticated Saccharomyces Cerevisiae Yeasts. Department of Molecular and Cellular Biology, University of Guelph, 50 Stone Rd. E,Guelph, ON N1G 2W1, Canada. , 27 Sept. 2017, www.biorxiv.org/content/early/2017/09/27/194969. PreviousDr. 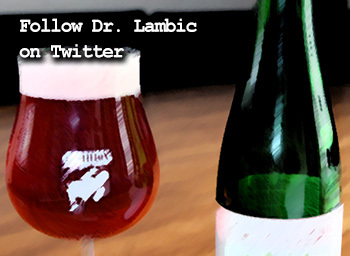 Lambic Is Opening A Brewery! Hey Matt. Where did you get the filter for your pot? I found 2 separate locations (same manufacturer) but they seem to want close to 500 bucks for 1 and feel its far too high seeing as my 30 gallon pot was less money and comes with 1.5 TC clamps for both temp/valve. Do you feel its worth the money even with that or what do you believe? 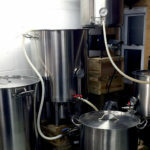 The nano brewing system at 2050 State Brewing was made by Colorado Brewing Systems and the BIAB style stainless mash screen was built by them with the system. I’m not surprised by the quote you were given. In general stainless work is expensive. I paid around $400 for a custom-sized false bottom for my 40 gallon mash tun. I think that if a piece of equipment will improve your process, brewday, or just make life easier, then it’s worth the money paying for quality work. Every brewer will have to determine what value they place on any piece of gear and go from there. Great post Matt, I hope you keep writing! 1. In the second run did you wait for primary fermentation to finish before adding the fruit? 2. Did you grow a starter for the Brett or just add the vials directly? In the second run we added the fruit when the fermentation was slowing down, but it had not fully finished. We did not grow a starter for the Brett. The vials were added directly. These were very fresh vials. Had they been older or of questionable vitality, I would recommend doing a starter. Funny, did nearly the same thing, except what happened was I had a high FG on my Kveik Farmhouse (1.017), so I decided to split up the batch and do a secondary Brett fermentation on one half using Yeast Bay’s Amalgamation I ( really wanted that Pinapple Brett backbone to bounce off the Kveik Agrume profile), fermented it with Blackberries and Blueberries, and barrel aged it for 3 months. I was quite happy with the result ( very smooth beer to drink, feint odors of the spruce with a nice Brett backbone). I harvested the yeast and tried fermenting again in a Norwegian Farmhouse hoping to get a nice sour blend. The Kveik was so aggressive in the primary it overwhelmed the Brett and left it’s signature Kveik Orange Citrus kick with very little Brett character. My next attempt is going to try to splitthe Kveik with some Fantome and Oxbow dregs I’ve been growing. I want to see how the Kveik reacts with lacto … If you have any thoughts I’m interested.